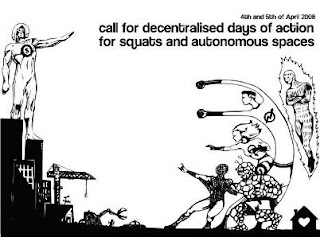 'On Friday the 4th and Saturday the 5th of April 2008, we call for two days of demonstration, direct action, public information, street-party, squatting... in defence of free spaces and for an anti-capitalist popular culture. All over Europe, repressive agendas are being pushed by governments. They are attacking long-standing autonomous spaces such as the Ungdomshuset in Copenhagen, Koepi and Rigaer Straße in Berlin, EKH in Vienna and Les Tanneries in Dijon, squatted social centres in London and Amsterdam, Ifanet in Thessaloniki, etc. In France, squats have become a priority target for the police after the anti-CPE movement and the wave of actions and riots that happened during the presidential elections period. In Germany, many autonomous spaces have been searched and attacked before the G8 summit. In Geneva and Barcelona, two old and big squatting "fortresses", the authorities have decided to try to put an end to the movement. Whereas it is still possible to occupy empty buildings in some countries, it has already become a crime in some others. In the countryside, access to land is becoming harder and communes face increasing problems from legislation on hygiene, security and gentrification by the bourgeoisie and tourists. All over Europe, independent cultures are being threatened. We're calling for an international preparation & coordination meeting on November 24th & 25th 2007, in the autonomous space "Les Tanneries", located in Dijon, France. It is a squatted social centre in a post-industrial environment, occupied since 1998. Thanks to years of struggle against the city council owning the buildings, the project has reached a certain degree of stability. It hosts a collective house, a gig room, a hacklab, a free shop, an infoshop, a collective garden, a library... We hope that many of you will be able to join. Full call here, contact april2008 at squat dot net for further information.